The kitchen in your vacation rental can often be the room that gets the most wear. Guests may not be familiar with your appliances, cookware and other kitchen implements. This can result in them being used or cleaned inappropriately, and damaged. It's not possible to avoid this completely, but here are some things that we have learned to do that help minimize it. Non-stick pans are going to get ruined. Perhaps on vacation family members that don't usually do much in the kitchen, try to help. 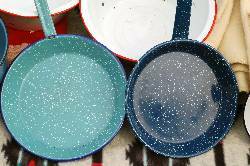 Whether it's using metal implements on the pans, or putting them in the dishwasher, they will wear quite quickly and need to be replaced. Unless you have a luxury vacation home where guests expect top quality cookware, try not to spend too much on your pans. Watch for sales, and stock up on non-stick pan replacements. Also, stock your kitchen with high quality nylon spatulas instead of metal ones. Provide plasticware cups, bowls and plates for kids to provide a non breakable option. Also avoid things that look microwave safe, but aren't. For example, enamel bowls or cups with decorative metal rims. While on the subject of plates and bowls, make sure to be generous with dishes and flatware. When on vacation people don't want to constantly have to do the dishes. Provide twice as many sets as your maximum occupancy so they don't have to do the dishes as often. Try and avoid materials and surfaces that require special care. For example, counter tops that stain easily, or copper sinks. If you do have these in your property, then make sure to provide the necessary solutions to care for and clean them. A certain amount of wear and damage is to be expected, and is just part of running a vacation rental. If you put your favorite non-stick pans in your vacation home, you're going to be upset. Hopefully some of the tips above will help reduce the wear and damage in the kitchen of your vacation rental like they have for us.